The chart shows that the same grainbill can be used to make about 15 barrels of Bitter, 8 barrels of IPA or 4 barrels of Barleywine. 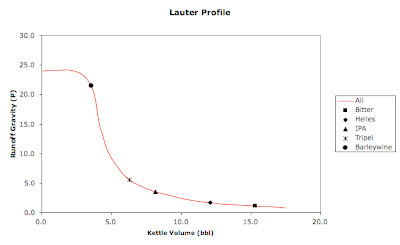 The areas beneath the curve and to the right of each mark represent the amounts of extract that don't make it to the kettle. No matter how strong or weak of a beer you're making, the mashing and lautering processes don't change very much. 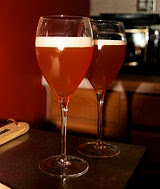 The only major difference is how much wort you collect from a given amount of grain.